Mattel’s latest batch of “Dolls of the World” Barbies are causing controversy. Specifically, the Mexican version, with her passport and Chihuahua friend. Others might say that all of the dolls in the collection (Mexico, Brazil, Chile, Argentina, Holland, India, Ireland, China and Australia) are uniquely stereotypical, but not offensive. They all come with passports, and each one is dressed in an outfit and accompanied by a pet that you would typically associate with that country. Holland Barbie for instance, wears wooden shoes. China Barbie holds a panda, India Barbie a monkey, etc. We consulted with the Mexican Embassy on the Dolls of the World Mexico Barbie, especially with respect to the selection of the Chihuahua. 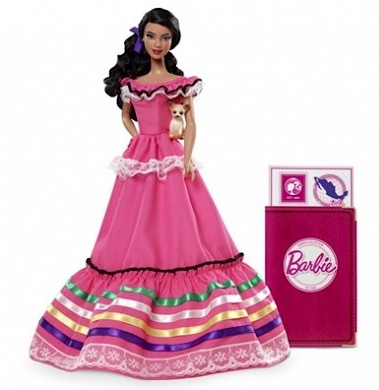 Our goal with the Dolls of the World Mexico Barbie, as well as the entire Dolls of the World Collection, is to celebrate cultural differences and tradition. Mexico Barbie doesn’t exactly scream racism. It’s not like she’s holding an eyebrow pencil in one hand and a baby in the other, eating chile con queso and yelling at people who look at her hoop earrings wrong on the dance floor.